"On Stage.......On Tour.......and On Fire!" 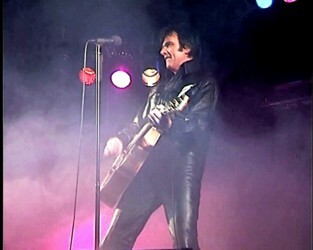 Steve Preston is highly regarded as Britain's top Elvis tribute artist. 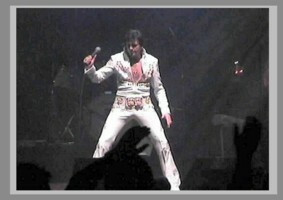 In fact, he is the only Elvis tribute artist to appear in front of the Queen at a Royal Command Performance! Steve Preston's first DVD, 'Steve Preston: Live At Shepherd's Bush', will shortly be released, and as promotion for this, his management has released a "teaser" DVD, Promised Land". And what a great performance it is! Remaining true to Elvis' uptempo arrangement, and replete with those moves guaranteed to thrill an audience, the result is a toe-tappin' and joyous expression of great music from a great entertainer. The Promised Land performance can be viewed on the official Steve Preston web site. 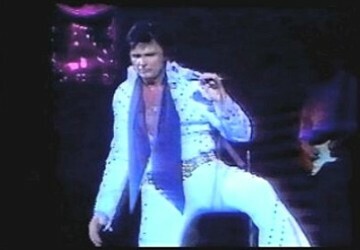 The clip is well produced, "book ended" by clips of Memphis and the Graceland Gates, and centred by Steve's excellent performance. Steve's "Elvis" image is expressive, his strong voice supplemented by excellent backing singers and a rich orchestral sound. Apart from the performers energetic projection of 'Promised Land', the DVD includes short clips from his upcoming Live At Shepherd's Bush release. The performances are again visually and aurally impressive. They are highly suggestive of a superb concert with a performer not only in control of his artistry, but one who has also established a strong connection with his audience. Steve Preston is a seasoned and highly polished performer. His look, moves and voice simply ooze the hundreds of hours of observing and practising "Elvis", that he has obviously put in, in order to perfect his craft. 'Steve Preston: Live at Shepherd's Bush' is scheduled for release around August 2006. It will cost approximately 10 pounds plus postage. It will be available at Steve's live performances and online from his website. Verdict: If "Promised Land" is a guide, the upcoming DVD featuring Steve Preston live at Shepherd's Bush in London is one not to be missed. Watching "Promised Land" it is not hard to see why Steve Preston is regarded as the UK's top Elvis tribute artist and one of the best in the world.